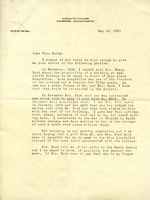 Bernice V. Brown asks Miss Berry for advice on how the Fords make gifts to schools. 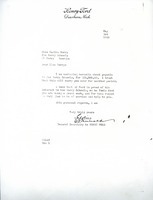 She has Mrs. Ford's interest but has heard nothing in a long time and asks Miss Berry how they make payments. 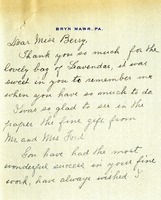 Bertha Black thanks Martha Berry for the bag of lavendar and congratulates her on the gift from the Fords. 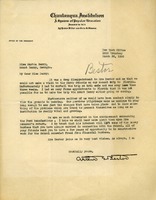 Miss Berry thanks Mr. Bestor for the congratulations and explains that it is difficult for many people to understand that Ford's gift was in buildings at the Girl's School so they still need to work hard to raise money to run the other schools. 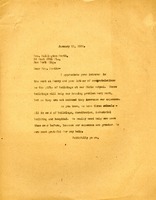 Mr. Bestor writes that he and Mrs. Bestor are very excited about the gift of the Ford buildings and congratulates Miss Berry. 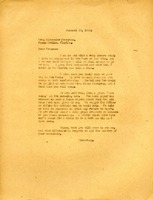 Henry Ford's secretary sends Miss Berry a letter with the donation of $25,000. 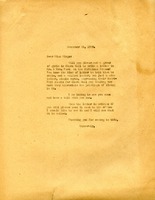 In this letter E.G. 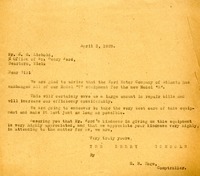 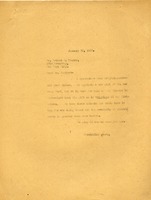 Liebold, General Secretary to Henry Ford, tells Mr. Hoge that he sent a letter to Mr. Grove in Atlanta to bring the Berry Schools the proper machinery to repair a Model A.
E. H. Hoge thanks Mr. Campsall for the shipment of thirty-six tons of Sulphate and Ammonia from Henry Ford and the Ford Motor Company. 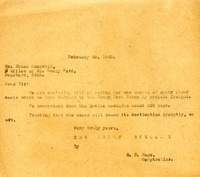 The shipment cost came to $2689.40 according to the Central Georgia Railway. 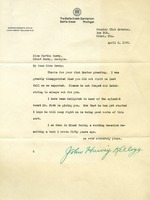 Hoge greatly appreciates the kindness from Mr. Ford and assures him that they enjoyed his most recent visit. 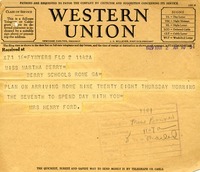 Mrs. Ford tells Miss Berry when she is arriving and what day she will spend the day.